Similar to the Drive, Fly, Float tour, this excursion features a thrilling helicopter descent to the canyon floor. This tour allows more time to wander along the bottom of the canyon and take in the views from a unique vantage point. After being picked up at your hotel, you’ll ride through the Mojave Desert in our unique Pink Adventure Tour Trekker vehicle. Enjoy the comfort of your own leather captain’s chair, with plenty of legroom and over sized windows for best views. The Mojave Desert is the only habitat in the world to feature Joshua Trees, so try to spot dense forests of them en route to the Grand Canyon. You’ll also see Lake Mead, a reservoir created by the Hoover Dam. 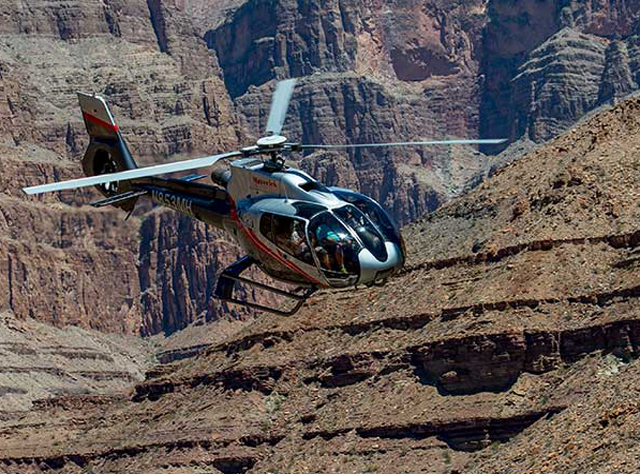 Upon arrival at the West Rim, you’ll climb aboard an ECO Star helicopter for a trip over the edge. Your ride features the latest innovations, like wraparound windows that showcase the canyon from every angle. Theater-style seats and air conditioning maximize comfort, while surround sound headsets and reduced-noise rotors make it easy to hear your personalized tour narration. Your finale comes at a private landing site 300 feet above the river for a rare, up-close look at the area. After your descent, stroll along the rim for photos and learning opportunities. Your local Certified Interpretive Guide has unique insight into the area’s geology, natural landmarks and ecosystems. They will also share information about the native people who call it home. Enjoy a picnic lunch, then see historic dwellings in a Hualapai village. You may even see dances performed in full tribal dress. There's also time to shop for handcrafted gifts, souvenirs, art and sundries. Your next stop is the famous Skywalk—a West Rim must-see. Upgrade your tour for a small $25 fee for unbeatable views from the Skywalk. Not for the faint-of-heart, the Skywalk is a transparent walkway that extends 70 feet past the rock rim and floats 4,000 feet above the canyon floor! You won’t regret stepping onto the glass after you see the vast expanse around you. Don’t miss the chance to have your picture taken by the designated photographer, as cameras and phones aren’t allowed. On the drive back to Las Vegas, your guide will take your picture at the Hoover Dam and regale you with tales of the dam’s construction during the Great Depression. We are proud to provide luxury services on this tour, including a BBQ lunch buffet with vegetarian options, sides and salad, bottled water. We also include all admission fees in your tour.